In the federal budget he proposed last month, President Obama included proposals to seek savings in Medicare and Social Security as part of his strategy to rein in the growth of those programs and break a deadlock with Republicans on how to tackle the deficit. The public over the last two years has consistently put the priority on maintaining entitlement benefits over cutting the deficit. In a March survey, 55% said it was more important to keep Social Security and Medicare benefits as they are while 34% said cutting the deficit was more important. 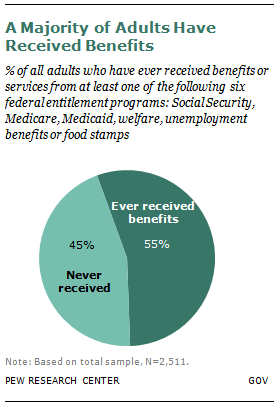 The survey found that most Democrats (60%) and Republicans (52%) said they had benefited from a major entitlement program at some point in their lives. So had nearly equal shares of self-identifying conservatives (57%), liberals (53%) and moderates (53%).